The Argonne Club is hosting “Breakfast with Santa” on Saturday, December 7, 2013, from 9 a.m. to 2 p.m. at the Bistro 213 cafeteria. 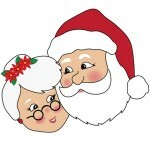 Join Santa and Mrs. Claus for family pictures, crafts, magic and games. Tickets to sit with Santa are $4 per child and are available from Carol Pesavento (ext. 2-3475, cdixon@anl.gov). Two buttermilk pancakes, two scrambled eggs and two sausage patties or two bacon strips, hash browns and milk or 10 oz. juice. No lunch items served. Additional items such as fruit cups, health bars and bakery items are priced separately. Breakfast will be served 9:30 a.m. to 1 p.m.
Breakfast Meal Tickets are $5.50 per person or $6.50 on the day of the event. Come any time for the games, activities and children’s crafts. Sit with Santa any time after your number has been called. Teens in need of community service hours can also participate at this event. For more information, contact Penny Kolpacki at ext. 2-5201 or Suellen Cook at ext. 2-3672 or ArgonneClub@anl.gov.